God's plan for our life is simple - We know Him, we love Him, and we serve Him, so that we can be happy forever with Him in heaven. 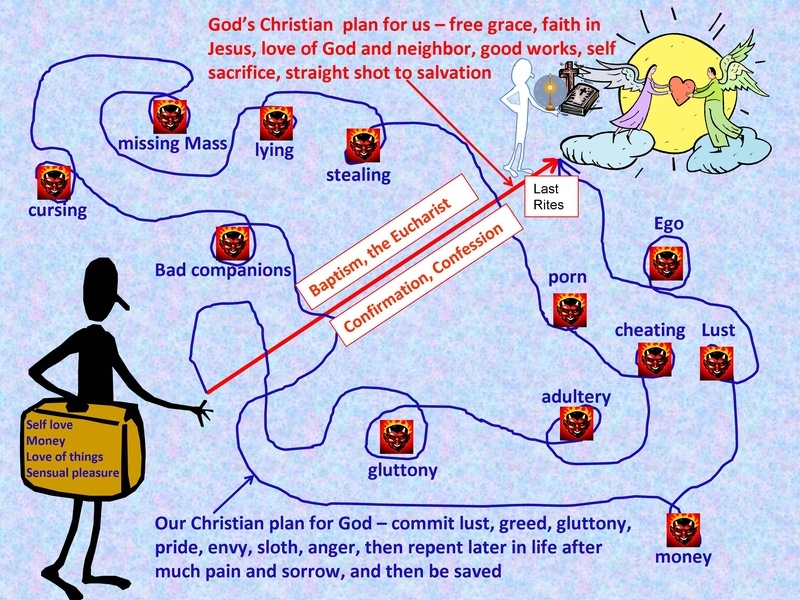 Let's take a look at the picture above and see how, a lot of times, our plan differs from His. The angled redline above represents God's plan for us. It is uphill all the way, but notice how he gives us the sacraments to help us in our uphill struggle. The blue line represents our own plans for God. Notice how it meanders all over the place, crooked as can be, and how we go in circles when entrapped by different kinds of sin. And guess who is lurking in any one of these infernal do-loops just waiting to nab us - satan. Some of the circles are bigger than others, which means that each person has his or her own peculiar major and minor faults, that satan will latch onto to bring us down. He will disguise these sins as being beautiful and good, only to show us the evil after we have sinned. If we should die in these sins without repentance, the odds of us going to heaven are slim. Thanks be to God, the Last Rites are there for us upon death. And always remember the proverb - "God draws straight with crooked lines", meaning that no matter how much we stray, He is always waiting for us to straighten our lives out with His Gospel. And always remember - The natural way of man is to sin and go to hell. God knows this, and sends us SUPERnatural help through His Church. It's only by latching on to the grace-filled sacraments and studying His Word and applying it in our lives that man can overcome his natural tendencies to sin. And the more we struggle against sin and accept God's grace, the easier it gets to go up to the next level of spirituality. If we just accept sin in our lives as being OK and reject God's grace, then, of course, it becomes easier to go down to the next level of depravity. The person's soul at the bottom of the picture is black, due to his sinful nature. He is carrying excess baggage, namely self-love, money, love of things, and sensual pleasure. As he finally reaches heaven, notice how much smaller he is, and notice how his soul has now turned white. He has gotten smaller, because like John the Baptist said, "He must increase, while I must decrease." When we finally wake up and start practicing Christianity, we start to eliminate our pride and ego, and we start to trust Jesus to just take care of everything, thus making ourselves small in the eyes of the world. 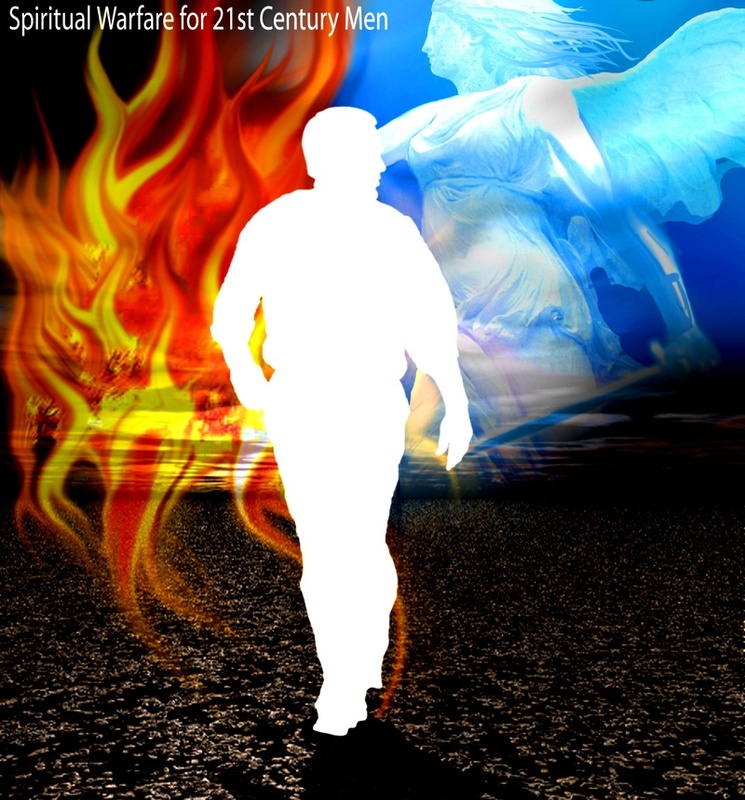 The person's soul has now turned white and has lost the black coloration, because as he trusted Jesus more and more, he stopped sinning, started praying more, and received the grace-filled sacraments more frequently. And if you look in his hand, you will see that he has dropped his excess baggage and has now embraced the Cross, the Word of God, and the Eucharist. And notice that the wandering blue line crosses the straight and narrow red line several times. This shows that God is giving you many opportunities and Christian friends during your wanderlust years to pull you away from your losing lifestyle into His way of life, the way of the cross. Please don't wait for the undertaker, do it NOW! Why? Because we will suffer mightily for every sin we ever commit, whether in this life or in the fires of purgatory after we die. Remember, there is always the forgiveness of the sin through confession, but the punishment for that sin can only be taken away through suffering, or by gaining a plenary indulgence. So are you on the make-it-up-as-you-go-along blue path, which meanders all over the place, and with seemingly no purpose? Or are you on the straight red line to heaven path? The choice is yours to make, right now! "If, devout soul, it is your will to please God and live a life of serenity in this world, unite yourself always and in all things to the divine will. Reflect that all the sins of your past wicked life happened because you wandered from the path of God's will. For the future, embrace God's good pleasure and say to him in every happening: "Yea, Father, for so it hath seemed good in thy sight."